Members of 36th Naval Infantry Battalion conduct anti-tank Rocket Propelled Grenade (RPG-7) launcher training at the International Peacekeeping and Security Center in Lviv, Ukraine during Operation UNIFIER. Ukraine’s Ministry of Defense reported at 12:30 PM Kyiv time that in the last 24 hours, no Ukrainian soldiers were killed and one Ukrainian soldier was wounded in action. In the last 24 hours, Russian-terrorist forces opened fire on Ukrainian positions on the Luhansk and Donetsk sectors of the front 16 times in total, including at least 5 times with heavy weapons. 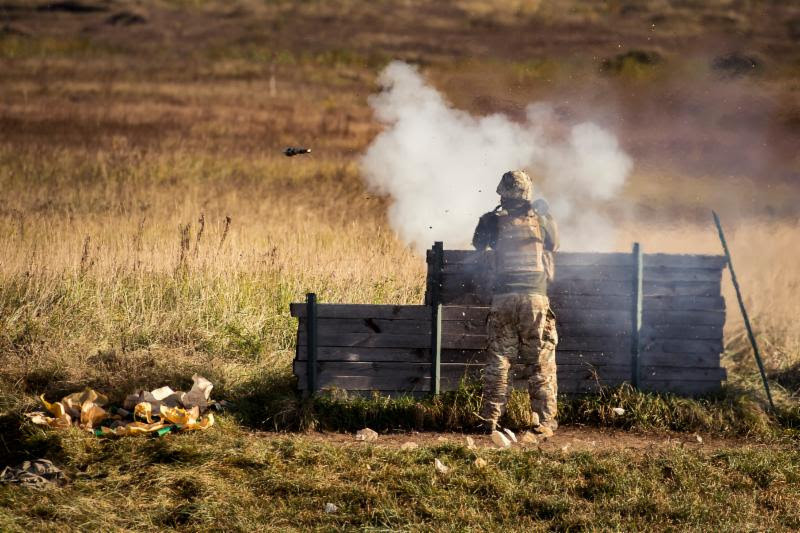 Returning fire, Ukrainian forces killed 3 and wounded 3 enemy combatants in the last 24 hours. Reuters reported, “Unknown assailants threw petrol bombs at a historic 18th century Orthodox church in the Ukrainian capital and attacked a priest early on Thursday morning, a church spokesman said, blaming Moscow for the incident. […] The petrol bombs did not explode and no damage was done to St. Andrew’s church, a baroque late 18th century church which sits on a steep slope on one of Kyiv’s best-known tourist spots. The church spokesman, Archbishop Yevstraty, said the attackers, whom police said numbered four, used a spray against a priest. The Kyiv authorities handed over the use of St. Andrew’s to the Ecumenical Patriarch, the global spiritual leader of Orthodox Christianity. […] ‘We see that Moscow’s henchmen are dropping ‘clear hints’ to intimidate representatives of Ecumenical Patriarch,’ Yevstraty said. Ukraine’s Foreign Minister Pavlo Klimkin is on a working visit to the US November 14-16. Ukraine’s Ministry of Foreign Affairs reported, “the main purpose of the visit is to hold the inaugural meeting of the US-Ukraine Strategic Partnership Commission on November 16. The meeting will be co-chaired by the heads of the foreign policy departments of Ukraine and the US.” Klimkin is also scheduled to hold talks in Washington with US Secretary of State Mike Pompeo and US. The European Bank for Reconstruction and Development (EBRD) reported, “An investment programme by rail transport company Ukraine Railways (UZ) is to receive a major boost in the form of a US$ 150 million senior loan from the EBRD. The loan will be used to acquire up to 6,500 general purpose open freight gondola-type wagons through an open international tender. The investment programme will help to maintain the UZ’s capacity, significantly improve its efficiency and reduce greenhouse gas emissions produced by its operations. Carbon dioxide emissions are expected to fall by up to 80,000 tonnes a year thanks to the new rolling stock. The EBRD will also assist UZ in certifying and improving its procurement processes and implementing an energy management information system, which will lead to better overall efficiency of UZ. This will be funded by the EBRD Shareholder Special Fund.